when your starving, dinner is finally on the table ,lovely aromas wafting under your nose , Who has time to wait??? And truly, all you want is a sip of wine... a good one. Please, for the love of all that good and holy. Just one good sip. Unlock the perfected taste of wine, scotch, and whiskey with the Electric wine Aerator Decanter tool. The wine airator decanter provides 6 times more surface area oxidation than your average gravity-injected funnel, thus creating alcoholic drinks that are much smoother, full-bodied, and flavorful. 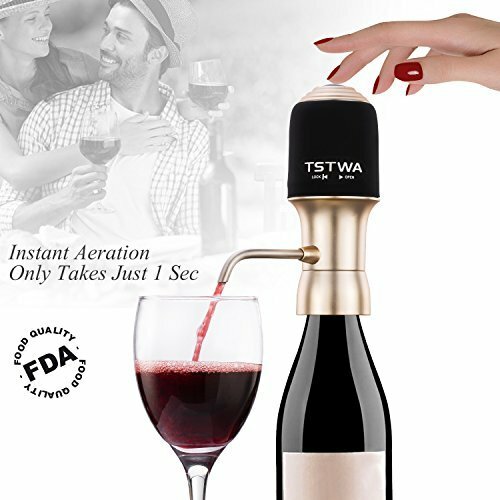 Experience luscious full-bodied drinks by simply attaching the aerator tap to the bottle and pressing the button for instant aeration by wine air aerator decanter. The decanter works with most standard US and EU wine, scotch, and whiskey bottle shapes. The flexible tube fits into shorter and larger bottles, particularly whiskey. wine infuser & wine tap aerator & wine decanter easy to clean . Please note: store your decenter in a dry place until your next use. If the product is not used for a long time, please remove the battery. ❤INSTANT & SIMPLE AERATION : Aerate and 6X oxidize with the push of a button (takes just one sec) , Impress your guests, amplify the ambience and enhance the purity, aroma, luxurious and taste of your favorite white or red wine with our wine Electric Aerator. If you have any questions about this product by TSTWA, contact us by completing and submitting the form below. If you are looking for a specif part number, please include it with your message.